How to Create a Table Tennis Logo? Table tennis logo can be used in different ways. It is used by specialized sports club or it can be a symbol of a certain competition or a trading mark, manufacturing the necessary products. The image for such logo can be laconic and simple, including a schematic images of one or two rackets and a ball. Sometimes a silhouette of a man playing ping pong is used. It is important that the picture looks dynamic, plain images are suitable only for business organizations such as regional table tennis federation. There are two popular color schemes for these logos: black and white or blue and red. Children clubs are an exception; you can use any colors for such logos. The background should be as neutral as possible and the inscriptions should be wide and graphic. 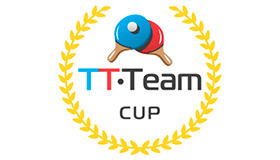 The best examples of corporate images meeting the above requirements are logos of Master Tour, Top Spin, TT Team Cup and ETTU. How do I create a table tennis logo for my brand?